Jennica Hagberg, one of our recent Instant Identity Marketing Makeover clients, came to us wanting a branding design that would emphasize the knowledge and professionalism she brings to the real estate business. As a young agent, Jennica wanted a design that had elegant sophistication to focus on her strengths and abilities, while at the same time with a fun and playful edge to acknowedge her fresh perspective and energy. After customizing the Instant Identity brand, “Carmel Macchiato”, with strong blacks, soft creams, classic golds and a bright white background the design does just that. 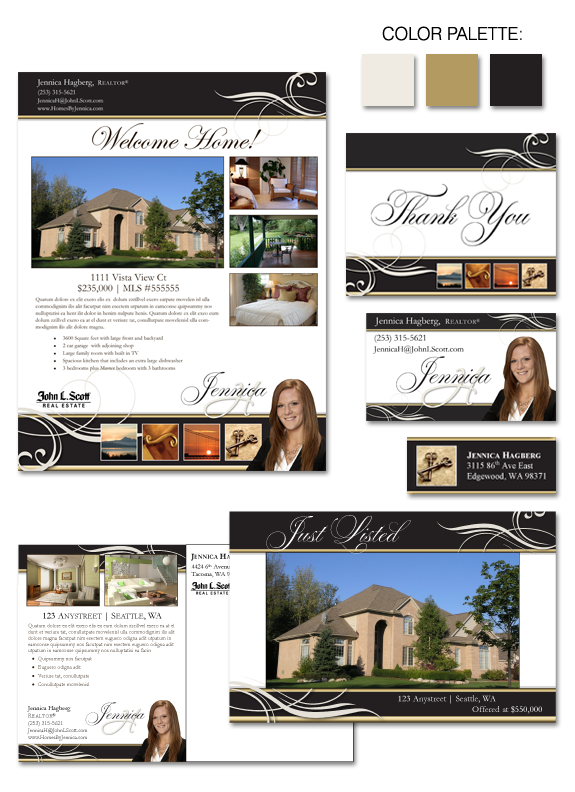 Finished off with local Northwest and home/architectural photography Jennica’s branding gives a classic statement of sophistication.